CM: The official profession of Makis Palantzas is shipbuilding and sailing, which covers him emotionally for the utter freedom that the open sea inspires to him. This occupation led him to become self-taught in art, which came to express his philosophy and generally his attitude of life. The love for art made of ropes was born to Palantzas from his childhood, during which he came under the spell of the "Prima" yachts yard of his father. § Palantzas learned to work with natural materials - like wood, reeds and ropes. At the time of creation he does not use a meter, but relies simply on his experienced eye. He brings a surreal idea in mind and takes care to fulfill it trough a direct process of the available materials. As the project takes shape, the artist may decide to make changes in keeping with the command of his eye. From his studio exit artworks that have his ultimate approval. Every idea of Palantzas is simple, but requires much work. 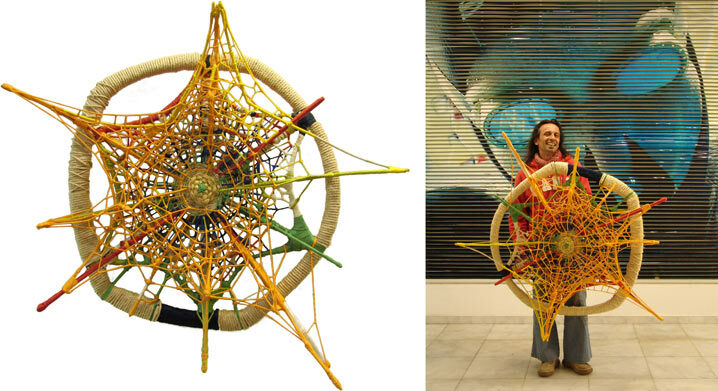 He makes art by assembling an armature of solid materials, which he covers in ropes of various colors and qualities (Kevlar, Natur, synthetic, plastics, etc.) for their different aesthetic quality. § In the case of Thought Palantzas aimed to create a circular pattern with rays. On the work's basic circle he adapted rays of different lengths and at varying angles. Integrating the rays with a net of ropes he created cavities which endow Thought with the vitality of pulsation. In Thought Palantzas used different colors which he took care to match, but his intention - especially in this project - was for orange to prevail as a color indicating strong vitality. Consequently the orange string of the rays comes in sharp contrast with the matt cotton rope that covered the circle in the background. This composition creates the impression of deep thought owing to its complexity, which alludes to a labyrinth of emotions. Palantzas' Thought is meant to hang on the wall and allow the viewer to experience personal readings of it.